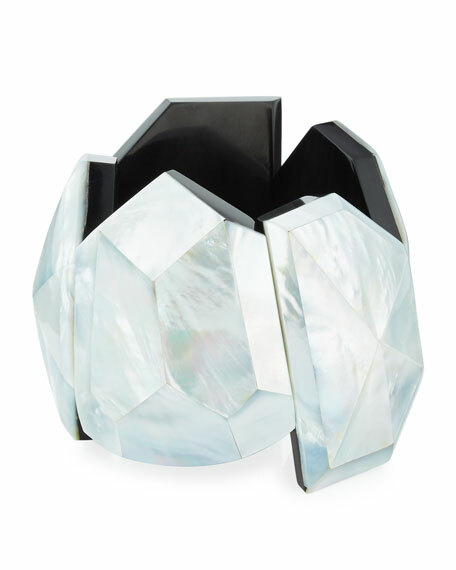 Viktoria Hayman "Star Dust" cuff bracelet in Genuine Mother of Pearl with a resin backing. Born in St. Petersburg, Russia, Viktoria Hayman turned her adoration for natural elements into an eponymous jewelry line. Finding inspiration from far and wide, Hayman travels the globe in search of unique materials for her modern designs-using shells, pearls, and semi-precious stones in combination with natural and exotic woods. A focus on natural texture and form translates into wearable art with international appeal that draws attention from fashion-conscious women worldwide.